Thel graduated with honors from the Ateneo de Manila University School of Law in 2004 and was admitted to the Philippine Bar in 2005. She obtained her degree in Communication Technology Management from the Ateneo de Manila University in 2000. 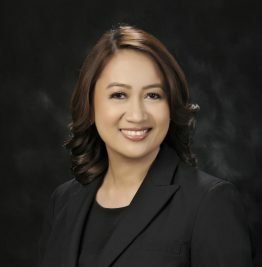 Thel joined SyCip Salazar Hernandez & Gatmaitan in 2004 where her practice covered various areas of law including corporate, commercial, labor, and litigation. She later moved to Kelvin Chia Partnership (Singapore office) as a foreign legal advisor particularly on corporate and commercial matters. After moving back to the Philippines, she worked for the Mining and Natural Resources Practice of another leading firm. In 2011, she left private practice and joined the Securities and Exchange Commission (“SEC”), where she was Securities Counsel of the agency’s Company Registration and Monitoring Department, and later Chief Counsel of the Market Regulation Department and Member of the Special Hearing Panel. Her practice in the agency covered the processing of various applications of domestic and foreign companies and the review and formulation of regulations and policies of entities involved in securities. Thel joined C&G Law in 2013 where her practice covers corporate and commercial matters. Thel specializes in corporate and commercial transactions, particularly foreign and domestic investments, mergers and acquisitions, and real estate transactions. She has assisted several companies in share and asset acquisitions and capital restructuring in the Philippines. She has likewise conducted due diligence and other activities in connection with such transactions. She has extensive experience in assisting clients from the ASEAN region in investing in the Philippines and in ASEAN countries such as Singapore, Vietnam, Indonesia and Thailand. Thel has advised and assisted various leading companies in the course of her practice in Manila and Singapore. Thel’s practice has also expanded to other sectors having advised and reviewed contracts of various companies on matters relating to banking, financing, technology, data protection, energy, and insurance. Assisted clients with the incorporation or establishment of companies in various industries including advising on related issues such as corporate structuring and foreign investment. Participated in due diligence projects relating to the investment or potential acquisition of diverse industries. Assisted clients in the acquisition or sale of properties and shares in various countries including the conduct of due diligence, drafting and review of sale agreements, joint venture or shareholders’ agreements, and other ancillary documents; managed the completion process; and advised on issues relating to the joint venture, acquisition or sale. Assisted clients in the review of their contracts and advised on issues relating to insurance including brokerage and consultancy. Assisted in providing general corporate and advisory services to both multinational and local companies. Acted for a leading real estate company in the Philippines on its acquisition of properties for development into commercial and residential projects. Assisted a real estate company in Singapore on its acquisition and financing of properties in Vietnam for development into residential projects. Advised a leading multinational energy company in the Philippines on its potential joint venture with a Singaporean company for the development and production of renewable energy in Indonesia. Advised an energy company in the Philippines on issues and reviewed contracts concerning its various projects. Advised clients on issues relating to technology and data protection. Conducted data privacy compliance exercises, audits and trainings for multinational companies in various industries including, among others, electronics, logistics, banking and financial services, power and mining. Advised various local and multinational clients on their data protection policies and manuals and other data privacy-related documents such as contracts and forms, and drafting necessary documents for compliance with Philippine data privacy laws. Assisted various clients in dealing with data privacy-related audits conducted by or registration and notice requirements submitted to the relevant government regulator. Advised various clients including a global leader online social media and social networking service in ensuring compliance with Philippine data privacy laws, as well as media and telecommunications regulations. Advising various clients in relation to issues on cybersecurity. Assisted clients in the drafting and review of banking and financing documents. Advised a leading mining company on its acquisition of properties in the Philippines for its power plant project. Assisted in the drafting and review of various agreements of mining companies. Acting as counsel at the SEC, reviewed applications for, among others, the registration and amendment of the constitutional documents of entities, increase or decrease of capital stock, mergers and acquisitions and registration under the Foreign Investments Act of the Philippines. Assisted the SEC in the review of rule proposals of self-regulatory organizations and other market participants and the existing and proposed regulatory frameworks and market infrastructures governing the securities market and participants.